Peel and grate the potatoes and squeeze hard to remove excess moisture. Melt butter in frying pan. Place 10cm diameter heaps of potato in pan and fry at high heat for 3-4 minutes, pressing down to flatten with a spatula. Flip over and fry other side until golden. Season to taste. Serves 4. Wash and slice potatoes thinly (may be peeled if desired). Butter an ovenproof dish. Layer potatoes, onions, knobs of butter and cheese, and season each layer. Finish with a sprinkling of cheese. Scald the milk, beat in the egg and pour over potatoes. Bake at 200C/Gas 6 for at least one hour, until well browned. Serves 4. Bake the potatoes until tender (1hr – 1hr 30 minutes at 180C/Gas 4). Cut in half and scoop out flesh, leaving a shell approximately 5mm thick. Mix flesh with butter, cheese and egg yolks, and season to taste. Whisk egg whites to soft peaks and fold into potato mixture. Refill potato shells, sprinkle with paprika, return to oven and bake for further 20 minutes until golden. Serves 4. 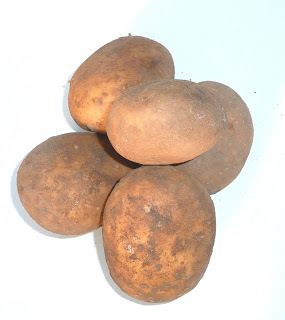 Wash and slice potatoes thinly (approx 4mm thick), peeling if desired. Brush both sides of each slice with melted butter and place in stacks of 6-8 slices, securing each stack with a cocktail stick. Season to taste and roast at 200C/Gas 6 for 45 minutes or until golden. Serves 4.